Overall, the latest World Bank data shows that India's poverty rate of 27.5%, based on India's current poverty line of $1.03 per person per day, is more than 10 percentage points higher than Pakistan's 17.2%. 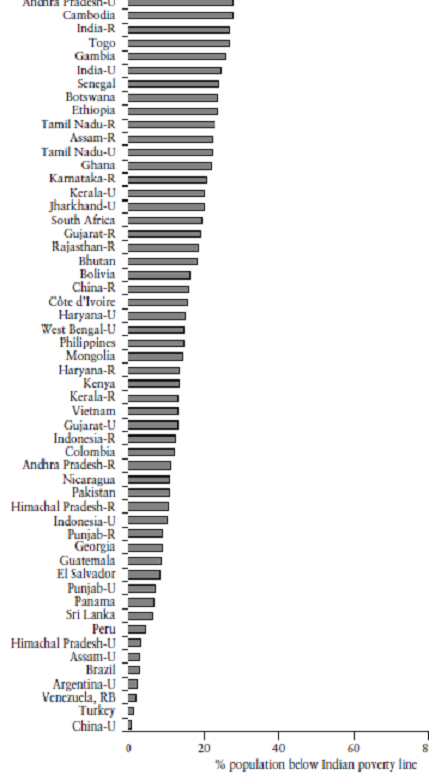 Assam (urban), Punjab and Himachal Pradesh are the only three Indian states with comparable or slightly lower poverty rates than Pakistan's. A recent report by a Govt commission in Pakistan found an "Education Emergency" in public education that paints a grim picture. This is Pak vs India as told by Pak's best intellectual. See what Dr. Hoodbhoy talks about Indian economy and Indian education. Don't shoot me Riaz. I am just a messenger. Pls compare sales of cars, IPad and other middle class items. Pak is no where close to India. Latest issue of Economist mentions India has 24 cars per 1000, not too long ago it was less than 10. 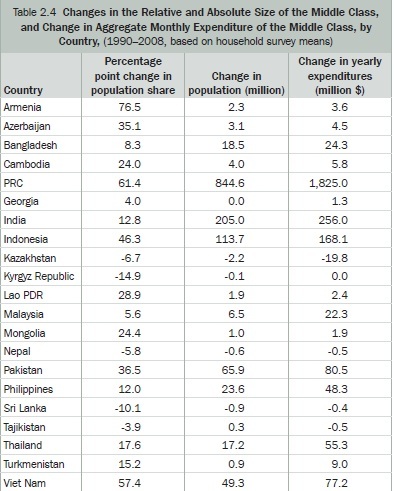 Pak is still ~12-15 per thousand and already declining. One look at the advertising industry of Pakistan for 20/20 cricket tells why Pak is rightly called backward economy. No money for cricketers. No wonder they want to shamelessly play in India and make money. These are real indicators of state of economy. Not fudged up numbers in blogs. Pakistan economy, like its people, is a joke. Anil: "See what Dr. Hoodbhoy talks about Indian economy and Indian education." Self criticism is a good thing, and every nation needs a few Cassandras to remind them where they are lacking. Pakistan has lots of Cassandras and India has few. Sanjay: "Pls compare sales of cars, IPad and other middle class items." Cars and iPads are not a substitute for better nutrition and more toilets which is what the world's largest population of poor, hungry, illiterate and sick people in India needs. Besides, Pakistan is also experiencing a consumption boom. Auto sales in Pakistan jumped 61% in July and are continuing to increase by double digits after the crash of 2008. How much is the fdi / fii investment? How are the capital market infrastructure with regard ot trading and settlement. India has been and even now is silently working in increasing its own strength. There are more statistics available in google explorer but the moot point for the both the country is that both has to go long way in creating basic infrastructure. Sure india has a better environment for investment compared to that what is perceived for pakistan. satwa: "how many companies have opened their back office in pakistan"
"Today, over 300 foreign multinationals have well established business operations in Pakistan. The US, European Union and Japan remain the largest three foreign direct investors with new inflows emanating from the Middle East and China." "As a consequence of geo-political risks, Pakistan is not seen as a friendly investment destination. Despite this, Pakistan's investment to GDP ratio has averaged 17% for the last decade and is 17% today after reaching a peak of 23% in 2007. In many ways, Pakistan's corporate leaders and professionals as amongst the most "battle hardened" pool of managerial talent in the world with the ability to manage risk and still show growth under the most challenging conditions". I think pak needs more generators first then IPADS OR TOYOTAS. qdoba: "I think pak needs more generators first then IPADS OR TOYOTAS." Yes, I agree that the energy crisis needs to be dealt with on a more urgent basis. Riaz Bhai, let it go. This has little to do with disease burden. Do read isteve.com on this matter. 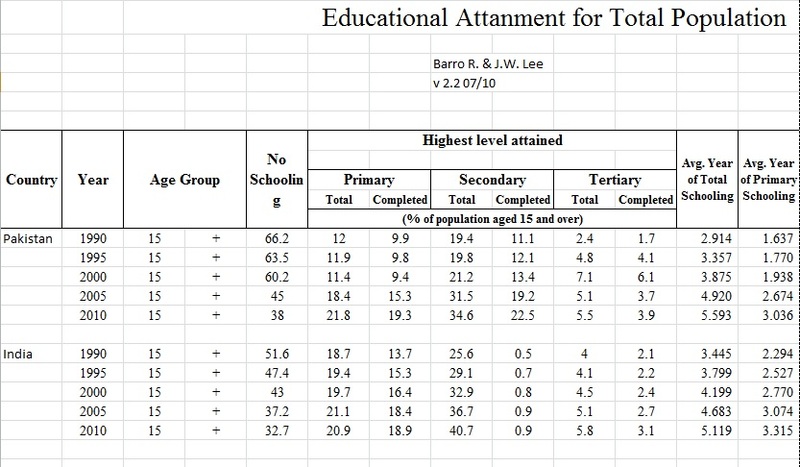 *Representative* S.Asian samples in Singapore (prior to the new wave of elite immigration ), Fiji, South Africa and the Carribean show that S.Asians are almost one standard deviation behind whites. The disease burden hypothesis is one of many hypotheses that liberals come up with to pretend that the distribution of IQ is identical across races. This is simply untrue. 100,000. Higher rates of above 15 per 100,000 are seen in China, Hong Kong Special Administrative Region (Hong Kong SAR), and India and still higher rates of above 20 per 100,000 are seen in China, Japan, the Republic of Korea, and Sri Lanka. According to The Fiber Report 2009/10, Indians consumed 4.18 million tons of cotton while Pakistanis consumed 2.558 million tons. Assuming a population of 1.2 billion for India and 180 million for Pakistan, the per capita cotton consumption works out to 3.48 Kg in India and 14.2 Kg in Pakistan. Mr. Riaz you are talking a lot about India and trying to reflect the black side of the coin. This clearly demonstrates your concern for India and Indians. Let me know how many PhD's pass out of Pakistan as compared to 5000 a year in India. How many companies like Tata, Reliance, Infosys, Vedanta are operating in Pakistan. Comparing the present GDP it seems like Pakistan is no where as compared to India. I would like to suggest you one thing DO and DON'T just speak, its your work which represents Who you are. We seem have a lot of juggling going on in terms of taking nominal per capita GDP figures from some place and PPP ratios from another place and so on. Since this article already includes a link for implied-PPP from the Trading Economics database service, I think it would be more consistent to use the WB/IMF data from that source to make your point. 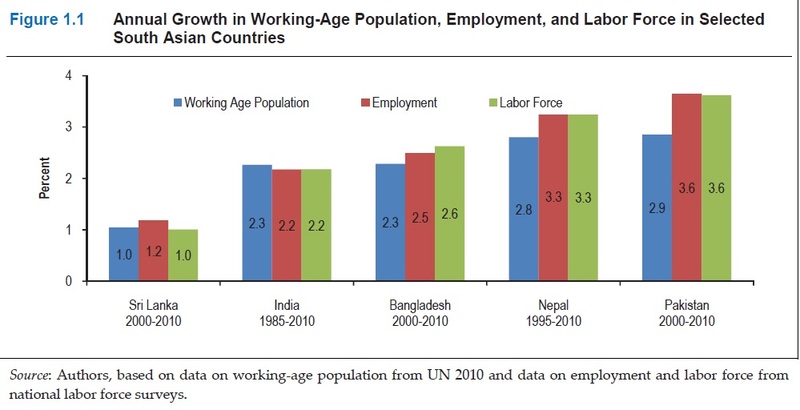 1) Bangladesh is rapidly catching up with Pakistan. In 1992, Pakistan was 160% richer than Bangladesh (Pakistan 1400$, Bangladesh 550$). While Pakistan stagnated under Bhutto/Sharif, Bangladesh surged forward to finish 2003 with Pakistan now only 80% richer (Pakistan 1800$, Bangladesh 1000$). Pakistan and Bangladesh then both boomed, to finish in 2010 with Pakistan now only 60% richer (Pakistan 2700$, Bangladesh 1650$). 3) Sri-lanka and Pakistan were comparable in 1992, with sri-lanka only 15% richer (Pakistan 1400$, Sri-Lanka 1650$). While Pakistan stagnated under Bhutto/Sharif, Sri-lanka surged forward to finish 2003 with Sri-lanka now 66% richer than Pakistan (Pakistan 1800$, Sri-Lanka 3000$). Pakistan and Sri-Lanka then both boomed, with Sri-lanka pulling even further ahead to finish with Sri-Lanka now 85% richer (Pakistan 2700$, Sri-Lanka 5000$). 4) Over the 1992-2010 period Pakistan showed the smallest expansion, with Pakistan's per capita GDP PPP basis only doubling over than period. Sri-Lanka and Bangladesh experienced faster expansion, with their per capita GDP PPP basis trebling over that period. 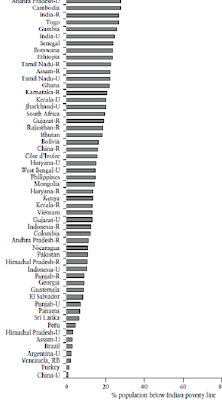 India showed the fastest expansion, with a quadrupling of its per capita GDP PPP basis over the 1992-2010 period. 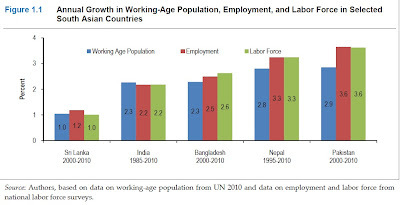 If Pakistan continues to stagnate (GDP Growth Rate < Population Growth Rate) under Zardari/Chaudhary/Sharif, there is a very real danger that everyone else in South Asia will move forward and even Bangladesh will surpass us in terms of per capita GDP PPP basis in 10 years time. The sooner we recognize the reality, the sooner we will be able to deal with our problems in Pakistan. Denial and figure-juggling is not going to get us anywhere. Convoluted arguments in cyberspace do not change the physical facts on the ground. HopeWins: "Since this article already includes a link for implied-PPP from the Trading Economics database service, I think it would be more consistent to use the WB/IMF data from that source to make your point." I have taken the nominal per cap gdp figures from the primary sources; Economic Surveys published by the govts of India & Pak. The preliminary official estimates by Economic Survey of Pakistan are indicating that Pakistan's nominal per capita income has increased by 9% to $1,372 in 2011-12 from $1,258 in 2010-11. India's PPP factor of 2.9 appears to be bogus because WB and IMF use 2.3 as PPP for the income range for India and Pakistan. (1b) whereas Pakistan remained relatively open. (2b) whereas India was a rare suppliant at the IMF. (3a) India poured money into heavy industry, developing huge steel and refining industries. (3b) Pakistan has little industry worth mentioning. How many of these things are true today (2012)? And how many have changed? How many of these trends have magnified since 1999? And how many diminished? It’s the middle class that makes the difference. India’s represents 32 percent of the total population and is growing at 1 percent annually. By investing heavily in education and entrepreneurship, they hope half the population will qualify as middle class by 2040. Pakistan’s middle class is about 12 percent of the population, and struggling as more and more people slip below the poverty line each year. India’s political leadership is putting out all the right signals. India has a Knowledge Commission headed by a world-renowned expert serving as an adviser to the prime minister; a Ministry of Human Resource Development, and a strong and centralized University Grants Commission. New Delhi alone is spending 3.5 percent of GDP on education, with 1.03 percent, or $11.5 billion, on higher education alone. This federal allocation is in addition to the states financially supporting university budgets, in some cases covering up to 80 percent of their costs. Pakistan is spending only about 1.3 percent on education and 0.22 percent on higher education. 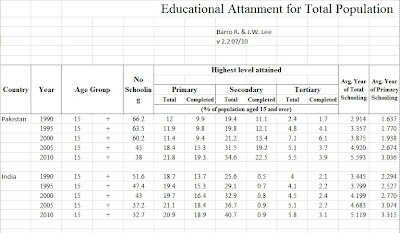 Sixty-four years ago, Pakistan and India started out evenly enough in terms of education and skilled-workforce levels. India has overshot us and is now competing with the big boys, swiftly and dedicatedly catching up with the developed world in higher education, science, technology, innovation, and research. Pakistan cannot afford to be left behind. We cannot allow security threats, the financial and ideological allure of Islamist radicalism, and bad governance to defeat us. Shoring up higher education and innovation are the solutions that will yield tangible, long-lasting benefits. Yet we are only capable it seems of dialing down attention to areas that can guarantee our success. Pakistan must push to improve and expand higher education. With so much at stake and so much we can do, this is the wise way forward. Anon: " Pakistan’s middle class is about 12 percent of the population, and struggling as more and more people slip below the poverty line each year." Nonsense! Pakistan's middle class is 40% of the population vs India's 25% of its population. And Pakistan has continued to offer much greater upward economic and social mobility to its citizens than neighboring India over the last two decades. Since 1990, Pakistan's middle class had expanded by 36.5% and India's by only 12.8%, according to an ADB report titled "Asia's Emerging Middle Class: Past, Present And Future. Per Capita GDP went from 663$ in FY04 to 1015$ in FY08. The increase was 352$ over 4 years. Per Capita GDP went from 1015$ in FY08 to 1372$ in FY12. The increase was 357$ over 4 years. We did >>BETTER<< during the last 4 years of the Zardari-Bust than we did in the preceding 4 years of the Musharraf-Boom. Can you explain how this happened? PS: By way of reference, please also see fig 1.1 on Page 2 of the same file linked above. ..Pakistan's investment to GDP ratio has averaged 17% for the last decade and is 17% today after reaching a peak of 23% in 2007." Even assuming a low initiating ICOR of 3, we will still need an average investment-to-GDP ratio of 21-24% to achieve an sustainable 7-8% average growth rate in the medium-term. So what is our "investment to GDP ratio" now? 1)How many Management Institutes are there in Pakistan which can figure among top 100 Business Schools of the World? India has IIM(A), IIM(B), & ISB. 2) Again I want to understand is there any Medical College in Pakistan which can match AIIMS?. 3) Also I want to understand what is strength of PAK Non-Residents, and names of some women/men who made it to the list of Forbes Most Powerful persons list?. 4) Also want to know the strength of Pakistan Film Industry, and what is the average remuneration they receive for acting? 5) Also I want to know the strength of Pakistan's Television Industry? 6) Milk Production in Pakistan? 10) Software & Hardware Industry? 11) Railway Industry? Aviation Industry? Are they indigenous? 12) Banking & Insurance Industry? Mutual Funds Industry? 13) How many people are covered under Pension Scheme? If according to your report if India is so backwards than Pakistan then why it is so major players are investing in India? Frankly Indan: " I just want to know few things:-"
I have blogged about most, if not all, of the questions you are asking. Please search my blog to get your answers. Irrespective of the relation between both the countries, no one can deny that both the countries have some high caliber intellectuals. You are surely one of them. I respect you for your knowledge and seek blessings from you. I only hope that one day we both shed our differences and be united. Thanks. I shall continue to follow your blog.